Lisa Goldman and Morocco won the $25,000 Tapestry Farms Grand Prix, sponsored by the Struve Family, during the 2015 Showplace Jumper Spectacular. Roscoe, Illinois - Sept. 5, 2015 - It was a day for the memory books for Redcoat Farm, and especially for professional rider Lisa Goldman. Not only did her students shine in the 2015 USHJA Children's and Adult Amateur Jumper Regional Team Championships, but she topped off Saturday with the win in the $25,000 Tapestry Farms Grand Prix, sponsored by The Struve Family. Goldman was the pathfinder of the class with Morocco, capturing the win with an untouchable time of 38.087 seconds. "Winning today was the icing on an incredible day," Goldman said. "Morocco did a great job out there, and he was really revved up. I am so excited though about how fantastic the whole barn has done during the Showplace Jumper Spectacular. Louisa [Brackett] competed her first grand prix today with Aslan, and she ended with only four faults, which is so exciting! One of our students was on the Silver Medal Team for the Children's North Regional Team Championship, and Brenda [Perkovich] was on the Gold Medal Team for the Adult Amateur Regional Team Championship. This day could not have gone any better, we even won the Barn Competition earlier this morning!" 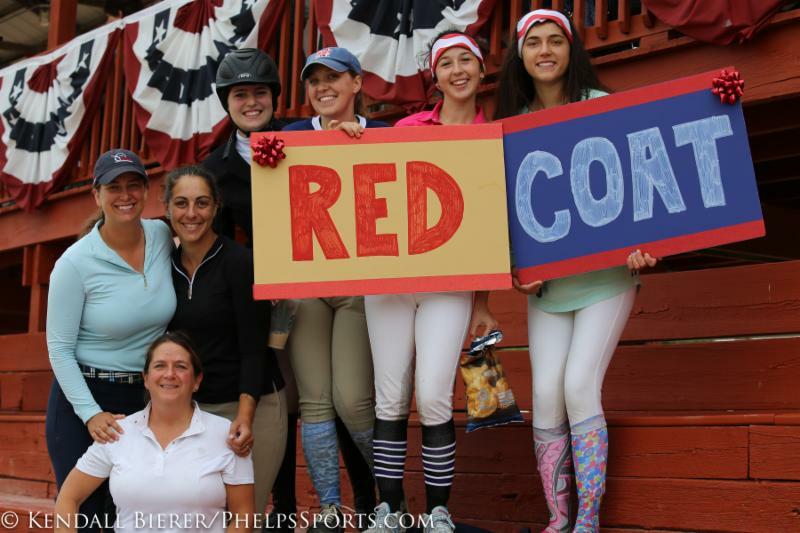 Red Coat Farm won the Barn Competition held during the 2015 USHJA Chidlren's & Adult Amateur North Regional Team Championships. Sixteen horse and rider combinations mastered Anderson Lima's opening round, making for a nail biting speed track. Goldman, the first to find her way with Morocco, knew that she had to put on the pressure with several contenders hot on her heels. She kept a speedy pace throughout the entire course, opting for the inside track and a slick slice to a skinny vertical, yet nothing stood in there, even when they had a minor slip and added a stride. "I slipped a little in the jump-off, but he is a little cat-like in that way. The course felt good, it was a fast jump-off and a great class," Goldman said. "I knew I had slipped in the jump-off and slowed down and added, so I knew I left the door open." Lina Rojas was the fourth in the return order, and she had her eye on the lion's share of the earnings. Riding Cafino Z, Rojas followed the same strategy as Goldman, yet they fell just shy of the winning time, breaking the beam in 38.171 seconds. Goldman said, "I heard the crowd scream while I was in the schooling ring, and I just thought to myself that I had lost the lead. They were so into it! When I went back in, I was shocked that Lina had not caught me, especially since she is one to look out for. She can go really fast, and her horses are amazing. She is a competitor that I definitely cannot take for granted when I am out there." "I have had him for four years, and we began working with each other when I was living in Europe, and we have continued to build our relationship now that we are living in America," Rojas said. "He has been doing a great job, we have won some High Amateur Jumper classes and have placed in several grand prix, and I am really happy with the horse. It is very difficult to win against Lisa and Morocco, who are a super team. It was so close, and I am so happy." "This is the first time I have shown at the Ledges facility, it is very nice and very friendly. Showplace always does a wonderful job managing the show, and the course designer is very good. I enjoyed Anderson's courses in the spring, and I enjoyed the grand prix today. He always builds accordingly, and his courses ask the right questions," Rojas concluded. Goldman finished out the class in third place with Hindsight, and duplicated her effort aboard Stonestreet, owned by Madison Billings, for the fourth place finish. "It was Hindsight's first time going double-clear today, and he has continued to get better and better with each grand prix. This was the first time he made it to the jump-off, and he has done so well. The fact that he came in third is wonderful, and it is showing how consistent he is becoming," Goldman said. "This was my first time showing Stonestreet, and he reminds me of Cowboy. He looks like him, goes like him, jumps like him so it was easy to acclimate to him. It wasn't hard to jump right into the prix with him." Maggie Jayne closed out the top five as the last of the double-clear efforts aboard Splendor, while Serah Vogus and Celestina rounded out the top six as the fastest of the four-fault efforts. In its usual hospitable fashion, Showplace Productions along with sponsors Telluride Farm, Kathleen Hope, Liz Atkins, Sue Leverick and Chicago Equestrian hosted an exhibitor's dinner to celebrate the 2015 USHJA Children's & Adult Amateur North Regional Jumper Championships and the $25,000 Tapestry Grand Prix. The Showplace Jumper Spectacular will conclude tomorrow with a day of classics and championships. The $1,500 Puddle Jumper Classic will kick off the final day as the first event of the morning, while the $1,500 Modified Child/Adult Classic, sponsored by Prairie Equine will pave the way for the $5,000 Individual USHJA North Regional Championships for both the Children's and Adult Amateur Jumpers. The afternoon will conclude with the $5,000 High Junior/Amateur-Owner Jumper Classic, sponsored by Old Barrington Farm. Star Creek Video will live stream the Regional Championship for the first time in its three-year history, with live commentary by Diane Carney, USEF R HU/EQ/JP Judge. Visit www.starcreeklive.com for live action, on demand footage and additional interviews. For the complete schedule of the Showplace Jumper Spectacular, click here. For more information, directions or complete results, please visit www.showplaceproductions.com.